No gesture is a small gesture. This intense album is another spiral of storming beautiful sounds is spreading gracefully from the meeting of Paulo Chagas and Troy Schafer. While the first recording I have heard by the two was a short E.P, ‘Gesture to the Declining Sun’ is much more elaborated and complex, spanning over forty minutes with half of this time spent oh so wisely on the track that happens to open this album and introduce us to this wild ceremony. The beautiful illustrations on the cover, done by Schafer, will tell you exactly what to look for inside of this album. 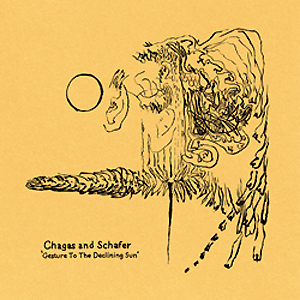 Chagas and Schafer boil together a wild, surrealist and mesmerizing voyage, which twists and turns like the ink traces you can see while holding this album in your hands. Deeper into the maelstrom, Chagas and Schafer put their strings and their listeners to a hard test. Shredding the strings into pulp and letting out only the most exquisite, extreme sounds out of them, well, this will inevitable create a difficult but well worthy experience to the ears. There are moments, like on the last quarter of the monolithic track that proudly bears the album’s name, where the feeling is of pure, sublime joy, a reward that can be won only by surrendering yourself to the music. My knowledge about Chagas’ work is limited, but I believe that this is one of Schafer’s finest works so far, and if we keep in mind the number of times I have probably said this about his earlier material, there is nothing better to do than sit and wait for the next one to be released.